Color can be a great tool to add more information into your charts, but only if you use it wisely. In one of my earlier blog posts, I talked about the process of visually encoding data using position, length, area, volume and of course, color. In many cases, color can be a great way to encode additional meaning into your charts, but adding a color with no purpose isn’t the answer. 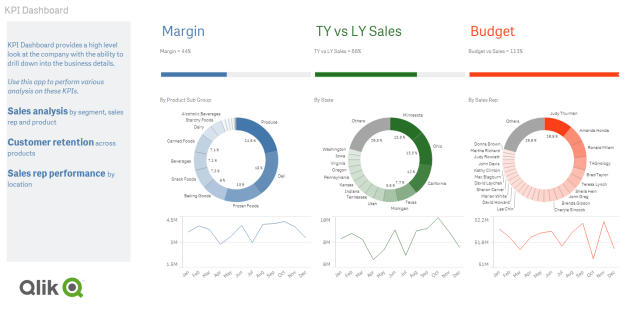 Oftentimes, people think dashboards are boring unless they add color. The real key to a successful dashboard is displaying your information effectively so that multiple audiences can derive meaning from it. I could write thousands and thousands of words about color but for this post let’s keep it simple and just discuss two broad categories: Color For Design and Color For Visualizations. 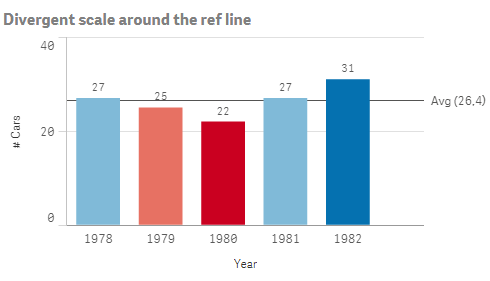 One of the best practices when it comes to data visualization design is maintaining a single color as standard for most charts. 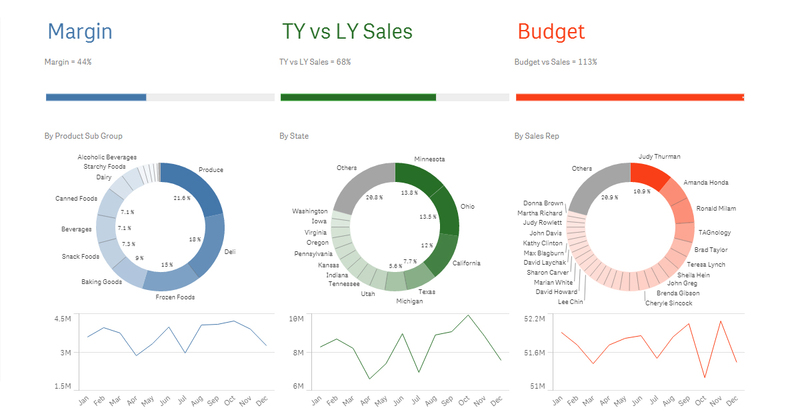 We built this standard into Qlik Sense and you probably have noticed it as part of the layout when you begin creating visualizations. When taking individual visualization best practices into account, the use of color gets more complex. 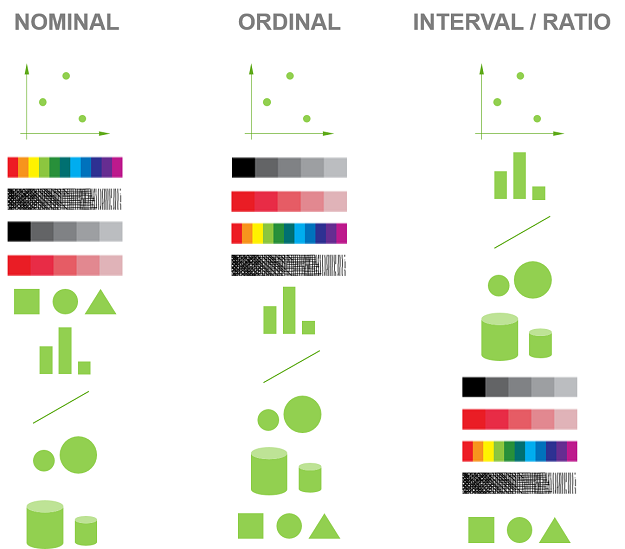 Let’s look at the three primary types of data and how color fits into the mix. For ordinal data you have no knowledge of the distance between your data points. With that in mind, once again relying on the gradient scale is in your best interest to indicate the order of the data. But in this case we’re not using a linear gradient as we don’t know the distance between the data points. 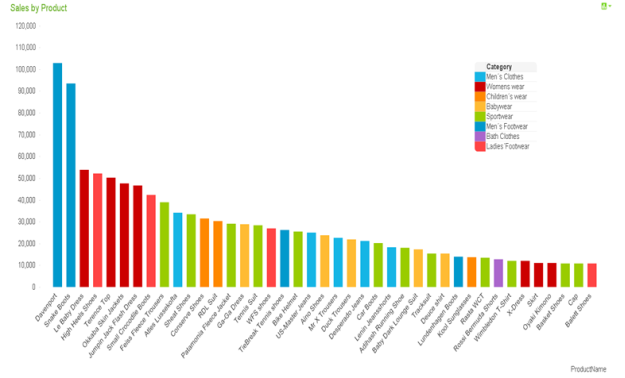 Finally, when it comes to nominal data: establishing unique colors to identify sets of values is going to be most effective for your audience. For example, if you use a bar chart to look at sales across products you can use different colors, as shown below, to indicate what category the product it is. No one category is more important than the next, but every category is represented clearly. If you are going to use multiple colors in this fashion, the maximum you should be using for these sets of values is between 10 and 20, depending on the capacity of your chart. What you don’t want is your chart to become a bag of Skittles! Looking to further experiment with color? There is a terrific website where you can experiment with a data map and select different varieties of color: http://colorbrewer2.org/. There are plenty of additional practices about color that I want to address in my future blog posts but if your chart looks like this…please start over and try again!